This month’s Essence review is for the Larimar Essence. Larimar helps to balance and stabilize the emotions and the etheric body, especially in situations where the difficulty is caused by shock or trauma. The energies of Larimar were used extensively in Atlantis to help balance the emotional and mental body as the humanity of that period explored and developed their spiritual abilities. Now Larimar is again an important vibration to help us while we go through the often intense process of transformation that waking up and growing spiritually in the 21st century requires. Larimar Essence has a wonderfully stabilizing effect on the emotions and the emotional body. It is a particularly good essence to use in situations where there is a lot of emotional upset and trauma causing struggle and distress. It will help to balance and stabilize the emotional flow and calm the mental body so that a different perspective can be seen. It is a valuable essence to help those who find their own emotions challenging, to accept and integrate them in a balanced way. Larimar also works powerfully in the heart chakra and in our experience is a wonderfully supportive essence to help bring greater stability in any emotionally stressful situation. Larimar also has the ability to reshape and repair holes in the etheric body. The etheric body is the energetic counterpart of the physical body and plays an important role in the maintenance of physical well-being. This important part of our subtle energy system can be damaged or weakened through shock, trauma, drug/alcohol abuse, accidents or simply being in very stressful situations for long periods of time. Larimar is an extremely useful essence to help neutralise the vibrations of shock and trauma, whether these have been experienced recently or in the past. Taken over a period of time it will also help to repair and strengthen the etheric body template and auric field. Larimar can be taken on its own as an individual essence or included with other essences in a stock combination. 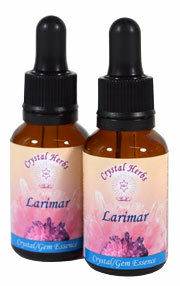 It is available as an individual essence here and it is also included in our Gem & Crystal Collection Set. It is also used in the following essence combinations; Feeling Safe, Healing Abuse, Auric Protection, Harmony & Tranquillity Spray & Auric Protection Spray.